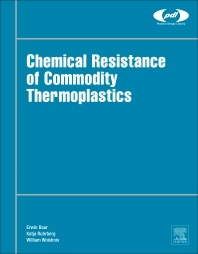 Chemical Resistance of Commodity Thermoplastics provides a comprehensive, cross-referenced compilation of chemical resistance data that explains the effect of thousands of reagents, the environment and other exposure media on the properties and characteristics of commodity thermoplastics – plastics which are generally used in higher performance applications. A huge range of exposure media are included, from aircraft fuel to alcohol, corn syrup to hydrochloric acid, and salt to silver acetate. This information has been substantially updated, curated, and organized by the engineers at M-Base Engineering + Software, a leading supplier of material databases, material information systems, product information systems, and material related simulation software. This book is a must-have reference for engineers and scientists designing and working with plastics and elastomers in environments where they come into contact with corrosive or reactive substances, from food, pharmaceuticals, and medical devices, to the automotive, aerospace, and semiconductor industries. Engineers and Scientists involved in designing and working with plastics across a range of sectors where plastics are in contact with chemical reagents and other substances that may react with plastic materials, such as food, pharmaceuticals and medical devices.